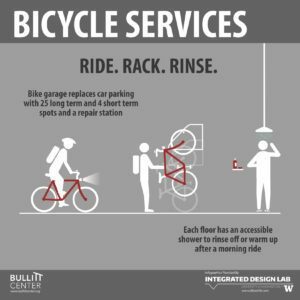 Safe bike storage, onsite showers and a repair station encourage bicycle use. Bike garage replaces onsite car parking. Parking for 29 bicycles in a covered garage, along with a repair station. Each bathroom has an accessible shower. In addition to high performance building, sustainable design also encourages high performance humans. The Bullitt Center not only relies on energy from the ground and sky, but also from its occupants. Set in a central, walkable neighborhood, the Bullitt Center is in a prime location to be accessed by bicycle (as well as foot or transit). 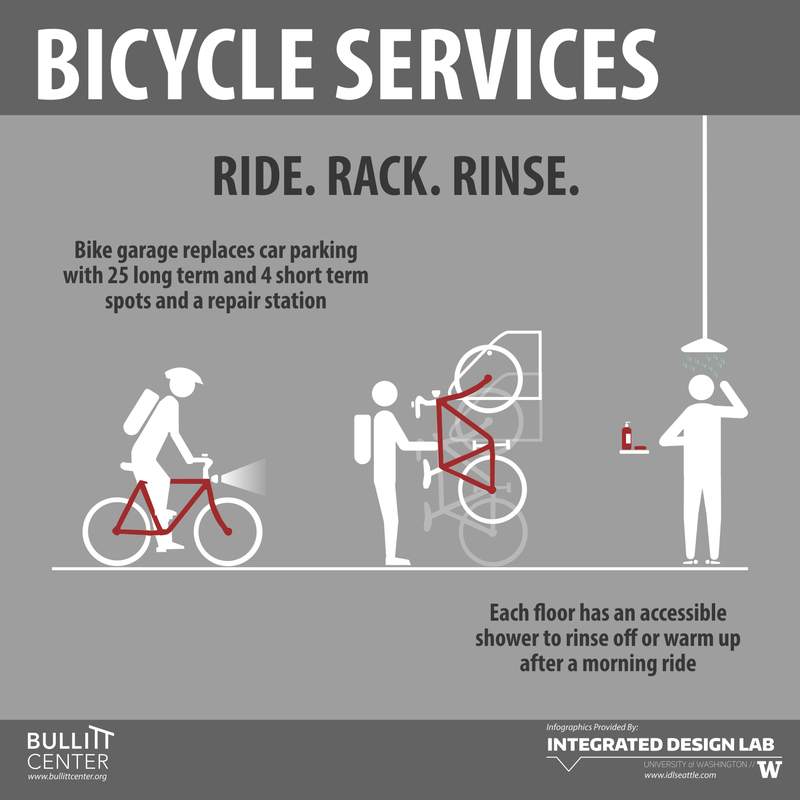 The Bullitt Center provides no onsite parking for single occupancy vehicles, instead housing 29 bikes. An adjacent workstation also provides a convenient space for repairs when needed. The final inducement for cycling to work is the hot showers and changing rooms that live on every office level. Nobody wants to spend the day at work shivering, sweaty, or soaking, so there is an opportunity to freshen up before work after the days ride. While far from high tech, these solutions offer simple ways to ease our reliance on cars. And with the advent of electric bicycles, and bike racks on public transportation, more and more people are able to use the bicycle for transportation and not just recreation.